The release of a Von Hertzen Brothers album is an event for me. More so this time as following the bombast and Hard Rock compactness of previous album 'New Day Rising', I really had no idea what to expect. 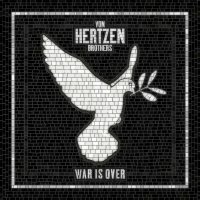 Happily, it's good news all round because 'War Is Over' blends the heavy riffs, punchy hooks and glorious melodies of its predecessor with the return of longer tracks, some sophisticated song-writing and that very distinctive Von Hertzen Brothers sense of the epic that marks them out from the competition. It all makes for an album that is by turns fun, heavy, thoughtful, intense and characteristically quirky. Title track and opener 'War Is Over' is an extended and elegant composition that sets an appropriately dramatic tone. 'To The End Of The World' and lead single 'The Arsonist' provide the album's short, sharp shocks, the latter appearing straightforward but embodying surprising touches that includes orchestration at the breakdown that would not be out of place on a Jon Lord concerto. The assured grandeur of 'Jerusalem' is one of the album's many high points, a bold statement of intent that features HIM's Janne "Burton" Puurtinen on keys. Elsewhere, 'Frozen Butterflies' builds around a twiddly guitar motif and 'Who Are You?' has a dark folksy vibe (think Led Zeppelin in a haunted cottage somewhere between the Welsh mountains and Kashmir), while 'Blindsight', the only track here written by younger brother Jonne von Hertzen, offers a delightful contrast between its wretching riff and catchy tune. Melody-wise, my top of the tree award goes to Kie von Hertzen's 'Long Lost Sailor' which has second single written all over it, though special mention must go to the hard-hitting 'Wanderlust', a gently melancholic, acoustic track that packs a powerful lyrical punch. 'Beyond The Storm' reintroduces the "war is over" theme and closes the album in fine fashion. Taking back full control of their music, the album has been self-produced with each brother taking responsibility for his own songs. Backed by highly regarded and technically adept drummer Sami Kuoppamäki, who previously played on their 'Approach' album, and engineer Tommi Vainikainen, the boys clearly felt confident enough to express themselves and it shows. 'War Is Over' is a beautifully composed, coherent and consistent album. The unique blend of influences, sounds and styles known and loved by Von Hertzen Brothers fans is alive and well. It's another great album from a truly fabulous band.